This month’s Boca Magazine features Raymond lee Jewelers; own master watchmaker Igor Polotsky in its Slice of Life segment. Igor, who is certified by the American Watchmakers-Clockmakers Institute as a 21st century master of his craft, has been a part of the Raymond Lee Jewelers family for the past 2 years of his three decade career. Igor is an indispensable asset to Raymond Lee Jewelers, as he is one of the 9 U.S. watchmakers authorized by Cartier to repair its watches; he also is adept at servicing the other luxury watch brands of Raymond Lee Jewelers, like Rolex, Patek Phillipe, and Jaeger-LeCoultre. Boca Magazine gets the inside scoop from the master himself on what inspired his career path (it has to do with some surprisingly heavy salt), why he left his life in native Russia behind, and the laugh-out-loud reason that Igor’s talents proved too much to handle for his employer at Tiffany & Co.’s 5th avenue showroom. Visit BocaMag.com to read Igor’s full profile on page 201 of the September/October 2011 issue. With all the news of recession and hard times, how to things like$39,000 handbags sell? What is it about the luxury items like this that can keep them afloat in our economic trials? Affluent shoppers, according to WWD, want to spend, spend, spend. Is this just another way of investing in special items? So, I’ll ask again ~ If you had the money, what handbag would you buy right now? Let us know what you think! As seen here, Camilla Belle is shopping in Beverly Hills at her favorite shop, Cartier of course and with her timeless beauty next to the sign makes her all the more beautiful and classy! Since she comes with a background of fashion, it makes sense! And it is because of mom’s Latin fashion expertise, I can’t wait to see her next move, “Prada to Nada”. Too bad she wasn’t in Boca Raton, FL shopping for a Cartier! Raymond Lee Jewelers would know exactly which watch would add to her classy and sophisticated style! I would pick this elegant Cartier Panther Vendome TT watch for her! Yes, Raymond Lee Jewelers has this available to sell right now! My personal favorite, is this amazing Cartier Ballon Blue with white gold, diamonds and the very stylish pink band! (see below) Oh, a girl can dream, right?!! Reported by Miyoshi K., for Raymond Lee Jewelers Blog. Raymond Lee Jewelers is Boca Raton’s Luxury Watches and Fashion Handbags Store! Cartier Love Bangle: A Feature Friday Encore! The Cartier Love Bracelet, first created in the early ’70s, has evolved into one of the most desired and sought after pieces of jewelry. With its provocative design and tiny screwdriver opening device, the Cartier LOVE bangle has become a cult classic among modern day collectors and jewelry enthusiasts. 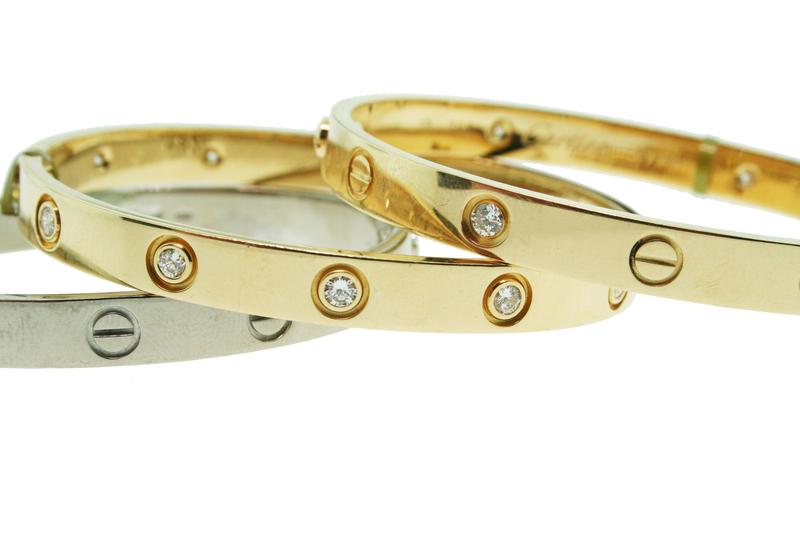 The Cartier Love Bangle has been one of the most popular items we’ve carried at Raymond Lee Jewelers. It is our pleasure to present on today’s feature… a Brand New 18kt White Gold Cartier Love Bracelet with original papers! You are Viewing this Cartier 18kt White Gold Love Bangle Size 17. This your chance to own this Cartier 18kt White Gold Love Bangle Size 17 at an amazing price of $3,495 plus shipping Buy it Now or Best Offer. 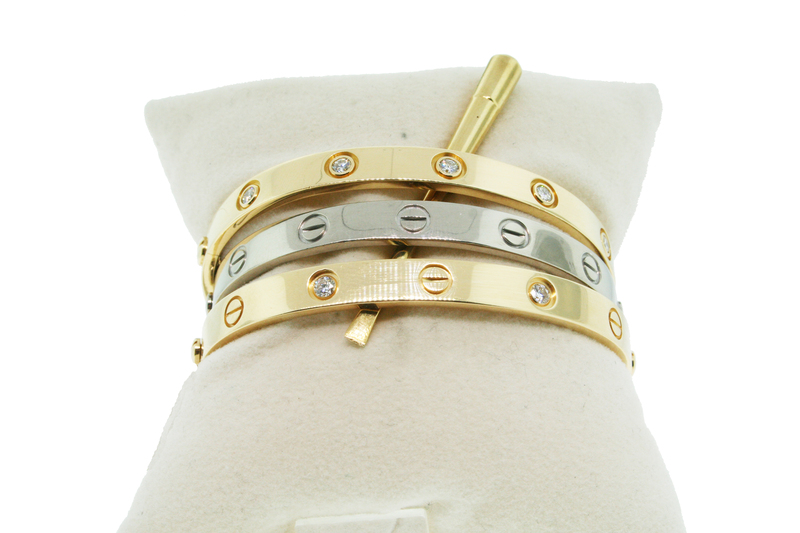 Cartier Love Bracelets: Authentic Bangles at Amazing Prices! At our Boca Raton location in the Palms Plaza, we are pleased to inform you that we are currently carrying three authentic Cartier Love Bracelets, offered at amazing discounted prices. Depending on your preference, one of these three Cartier classic bracelets from the LOVE Collection is certain to suite you just perfectly. Raymond Lee Jewelers is located at 22191 Powerline Road, Suite 12B in the Palms Plaza, Boca Raton, FL. Should you have any inquiries regarding our jewelry inventory, estate sales or appraisals, please call us directly at (561) 750-7808 and we’ll be happy to do all we can to help!